India's Far North: Ladakh's Magic Mountains! NAMASTE ! 2017... A Time For Adventure! 2017 IS THE RIGHT TIME. CALL OR EMAIL TODAY! GRAB YOUR BOOTS.... IT'S TIME TO GO! We Take Real People To Amazing Places! This northern border area of present day India only opened to tourism in 1974. Traditionally considered far western Tibet, this is the best place on Earth to see and experience traditional Tibetan Buddhism. The first independent kingdom of Ladakh was established in the ninth century. Encouraged by royal patronage during the fourteenth century, the Gelugpa (Yellow Hat) sect of Buddhism established an array of monasteries throughout the region. A new capital was founded in 1639 when a palace at Leh was built and nearby, well known Hemis Monastery was later built in 1672. Leh (population 30,000) became a main trading post along the Silk Route as well as one of the most exotic bazaars found in Asia. Being over the main Himalayan range on the Tibetan plateau (behind the "rain shadow") gives Ladakh a perfect climate for summer travel. Leh is served by several daily departures from Delhi but during summer season flights can book months in advance — so planning early is important. Once you arrive in Leh you immediately sense a much different climate from the rest of India. Here, the air is clear and cool where people are relaxed and very friendly. You are often warmly greeted by the Ladaki, "Julay! Julay!" For ground travel, you can take an overland route lasting two to three days — driving along one of the world's highest roads over a series of high passes from Manali, in Himachal Pradesh. Due to the altitude of the passes and remoteness of the area, it's usually best to use this route as a return trip — departing Ladakh when the road is open from late June to late September. We prefer flying up into Leh (at 11,562 feet, an altitude similar to Lhasa in Tibet). In order to acclimatize well to this high altitude, spend your first days nearby at a restful local family owned guest house. 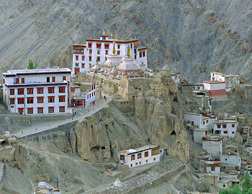 Enjoy time exploring fascinating Leh with its palace, monasteries, mosque and even some shopping. After a few days to adjust, you're ready to head to the hills! 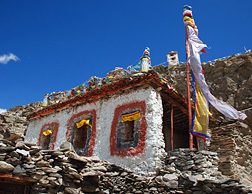 Ladakh offers a wide variety of trails and routes for mountain explorations. Short two or three day treks or very long multi–week adventures are available to you, but even short Ladakh treks are demanding as these Himalayan trails are very steep. Depending on your interest, treks can focus on the natural scenery, sacred mountain pilgrimages or secluded and historic monasteries. Most treks in Ladakh are often a combination of each! One popular trail route is known as the Markha Valley Trek (offered as a small group Scheduled Trek in July or August every year). This historic route carries you over a high pass and descending into a remote valley dotted with small villages, monasteries and miles of scenic hiking. 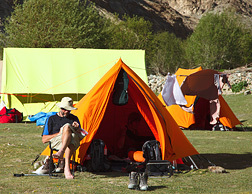 Another popular track is known as the Zanskar Trek or the "Darcha to Lamayuru route." It's a long trail route taking 21–23 days to complete. We offer it as a small group Scheduled Trek every other year. The Zanskar Trek takes you over seven stunningly high passes across the Himalayas from Wanla or Lamayuru. Considering acclimatization time in Leh plus time by car from Leh to Darcha and then to Manali in Himachal Pradesh, the total trip time to consider is about one month — but it's a trip you'll never forget! Ladakh trekking requires a practical minimum of two hikers — all food and gear must be transported by vehicle from Leh or Manali to the trailheads and back to be carried by ponies along the trek's rocky trails. 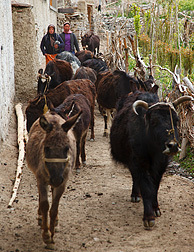 Our Custom Ladakh Treks are always outfitted with a guide and cook as well as the "horsemen." With a larger group or longer trip, the team expands to support a successful high Himalayan adventure. Ladakh's trekking season window is especially short because of the extremely high altitudes there. July and August are best for mountain trekking. June and September can even be a possibility for very short treks but will be very cold. For easier touring trips, the travel window can extend between May and October. In Ladakh, food choices are surprisingly varied and many visitors find the food offerings to be very enjoyable. 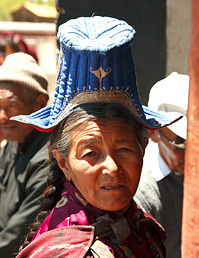 Natives traditionally lived on a steady diet of Yak meat, barley ("tsampa") and salty, yak–butter tea. These days there are plenty of additional items — local specialties like momos (steamed dumplings filled with meat or vegetables), western food as well as fresh fruit and vegetables. If you are a vegetarian or have strict diet limitations be sure to tell us and those needs can usually be met! If you prefer to explore by main roads you can tour Ladakh during most of the year. Due to the extremely long and cold winter, it's often best to tour between May and October, with the summer months of late June through early September as the prime time. Outside the main season, arrival in Leh must be by air when snow closes the seasonal road to Manali for much of the year. With an extensive road system, Jeep Safaris are a fantastic way to discover Ladakh. Beautiful Nubra Valley lies just 30 miles from Leh and over the 17,600 foot Khardungla Pass. Padum, found in the heart of the Zanskar region, lies a scenic three days drive away. One of the reasons Founder Effie Fletcher started Himalayan High treks was to keep returning to Ladakh as it is such a spectacular region! 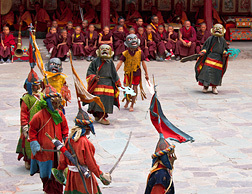 Popular with Buddhist travelers are trips to explore many of Ladakh's famous monasteries. Highlights include: Hemis Monastery, positioned inside a gorge on the western bank of the Indus River, is the largest monastery in Ladakh — known for its annual festival. Shey Monastery with it's nearby palace and festival on the 30th day of the first month of the Tibetan calendar. Thikse Monastery features its large statue of the future Buddha Maitriya. Lamayuru Monastery, spectacularly situated and home to an annual festival — a masked dance, which takes place on the 17th and 18th day of the 5th month of Tibetan lunar calendar. Alchi Monastery contains rare Kashmiri style Buddhist murals and dates back to the year 1000 AD. 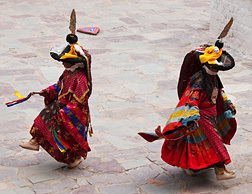 Most art and craftwork in Ladakh was originally developed to serve the practical needs of the local people. The village of Chiling is the place of Ladakh's finest metal workers (who were responsible for the huge Buddha found at Shey). In addition to practical items, craftspeople there produce many art and religious items in silver, copper and gold. Items you'll find in Ladakh are also similar to what you might find traditionally in Tibet such religious items, statues, jewelry, hats, bags, wooden items, masks, incense and decorative items. You'll also find Pattu and Baskets. Pattu is a warm and rough woolen fabric often used for traditional footwear and clothing. Baskets are usually woven from willow twigs or particular kinds of grasses. They are used for carrying vegetables and other items — even babies! 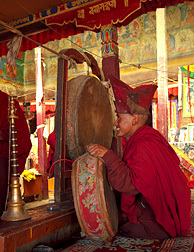 You'll also see Thangka Paintings, Pashmina Shawls, carpets, hand–woven woolen clothes and prayer wheels. In addition to locally made items you'll often see beautiful carpets, silk tapestries and other textiles brought from nearby Kashmir (just two days away by car). 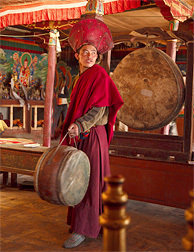 Many films and documentaries about Tibet are actually filmed in Ladakh. For example "The Tibetan Book of the Dead" a documentary narrated by Leonard Cohen is filmed exclusively in Ladakh. For reading we highly recommend Helana Norburg Hodge's book "Ancient Futures." 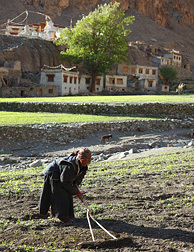 You may also want to explore the website of the non-profit she started: http://www.isec.org.uk/pages/ladakh.html and when you get to Ladakh you can visit their local center where they show the film version of Ancient Futures daily. Process: Custom Trips are unique by definition. It can seem to be an overwhelming prospect for you to design a Custom Ladakh trip that becomes a rewarding, once—in—a—lifetime success... and that is where we come in. Ladakh was one of our first trip destinations and it's an area we know very well from the inside. Our long experience (since 1988) gives us a local familiarity with Ladakh, combined with our network of local staff that you just won't find elsewhere. 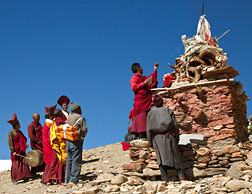 Dozens of travelers explore Ladakh with us each year and you can too. There are many options to keep your trip unique, affordable, enriching and safe. 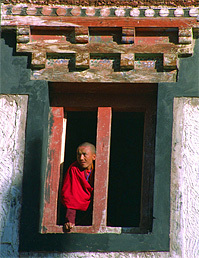 Often a trip to Ladakh is part of a longer trip in India. We can help wherever you're bound. Once you have the ideas for your Ladakh adventure, contact us to turn them into the adventure of your life. Give us your dream and we'll give you back an adventure that you'll never forget. Our Custom Trips page reviews how you can get started. Passport, Visa(s), Physicians Visit, Emergency Medical & Evacuation Insurance, Travel to/from Gateway City, Meals Beyond Above Itinerary, Beverages, Spending/Personal Money. Your Specification: The trip itinerary is based on your interest and input. Events can range from a mild vehicle tour to a long and strenuous alpine trek with accommodation in tents, tea or guest houses and high–level hotels, meals inclusive or exclusive, trail support, cooks and guides — all as you wish.